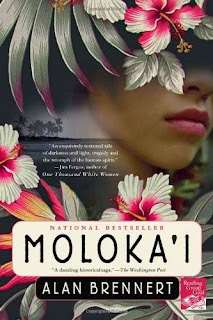 At the age of seven, Rachel Kalama is whisked away from her home and her family in Hololulu and sent to the island of Moloka'i. This is the place where those with leprosy are sent to die at the end of the 19th century. This is a heartbreaking story about the loss of family and the loss of life. But it is also an inspiring story about how people persevere over such horrible situations. I read Moloka'i by Alan Brennert for book club and I thoroughly enjoyed following Rachel from her childhood in Honolulu through her experiences on Moloka'i through her death. I had honestly never heard of Moloka'i and the settlement that was formed there. One of the things that struck me about this story is that the quarantined people on Moloka'i, although isolated from those they loved, built a rather full community with schools and jobs, friends and marriages. I highly recommend this book for book clubs. Our discussion was very full and interesting. There are many topics to discuss from the political and moral issues related to how people with leprosy were dealt with at that time, to the ways individuals reacted to their own family members who became ill. This review was written based on a copy of Moloka'i that I purchased.